First, the Core Blood Pressure Monitor. 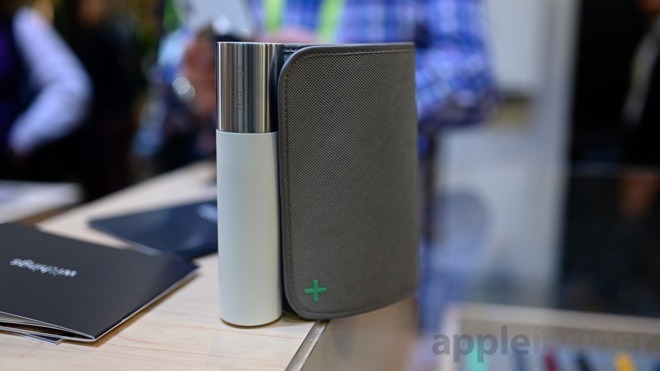 This new device builds a bit on what Withings had in the past but adds many new features. On the inner wall, there is a new digital stethoscope used to take a recording of your heart and to identify heart valve failure. On the inside of the cuff itself, there is a metal electrode which coupled with the outer metal tube is able to take an ECG, similar to the Apple Watch. While administering a test, it will let you know to place your hand on the end of the tube and wait for the reading to commence. While taking an electrocardiogram, a real-time heart rhythm is displayed on the side of the tube attached to the cuff. Lastly, it takes your blood pressure as expected. All of this data is displayed on the not-so-bright cuff, and fortunately synced back to your phone for later viewing or sharing with your doctor, since it's hard to see on the device itself. Next, Withings showed off two new analog smartwatches. Move and Move ECG look like a simplified version of the Steel HR without a few aspects like the screen. Instead, steps are displayed on a wheel within the watch face and synced to your phone. It tracks sleep as well, and packs a battery that will last well over a year. The ECG model, which is currently under evaluation with the Core BPM by the FDA, works by placing a finger on the side of the metal frame, just like Apple Watch. One difference is that Withings is able to complete the ECG in only 20 seconds, rather than 30. Move is entirely customizable, with the face, bezel, and band completely interchangeable and designed on Withing's website. So the ECG model alone can get a heart rate too, since there's no optical sensor? Does it take a continuous/resting heart rate? This seems pretty well what I want. With my (third) fitbit crapping the bed in a year, I wanted something that looks like a watch, has vibration alarm clocks, and long battery life, this will fit the bill.